1. I am delighted to be at the Tajik National University. This seat of learning has played a defining role in the making of Tajikistan, and continues to illuminate and guide its vision and progress. Your country and Central Asia, the great centers of learning and culture- Samarkand and Khujand, have nurtured the spirit of creativity and inquiry for centuries. You are proud flag-bearers of that enlightened scholastic tradition, of the voice of Rudaki and Bedil, from which not just this region but the entire world continues to draw sustenance and inspiration. 2. I have chosen to speak on the topic "Countering Radicalization: Challenges before Modern Society” for two reasons. First, your country has done commendable work to tackle this global menace and foster peace for one and all. And the world must recognize it. Second, the battle against terrorism, extremism and radicalism must be fought, first and foremost, in the minds of people, between those who believe in peace, love and humanity and those who feed on hatred, death and destruction. It is a battle of opposing ideas, of humanity on one hand and a make-belief world on the other. Talking to the youth, our future; and scholars, our guide and pathfinders, therefore, becomes essential. As the President of India, I am Visitor of 160 Universities and Institutions of Higher Learning. This has given me an opportunity to frequently speak to the youth in my country as well. 3. Our two countries have much in common. Our histories are rooted in inclusive and tolerant values. All religions and thoughts have prospered and blossomed in the land of the Pamir and the Himalayas. Today, we are confronted with those who wish to burn and destroy the fabric of our faiths, the embrace of our togetherness. 4. The people of this country have made enormous sacrifice to stop the surge of bigotryand faith-based regressive ideas from capturing centre-stage. This not only saved your budding Republic in the 1990s, but also firewalled your neighbouring Central Asian Republics. They too, were then, struggling with challenges that young nations face. We sincerely hope there is deeper understanding of the geopolitical significance of the Tajik civil war. 5. Today, as you can see around you, there are renewed attempts to impose obscurantist thoughts on peaceful societies. This is threatening the very foundation of human civilization. Their targets are people and societies, who value progressive life and respect diversity of faiths and cultures. 6. Notwithstanding your historic struggle and subsequent victory in the civil war, the long-drawn war is far from over. It is evident in every day brutal killings and senseless violence. Perpetrators of this evil seek legitimacy in scriptures, where none exist. No religion, none whatsoever, be it Hinduism, Islam, Buddhism, Christianity, Sikhism or Judaism justifies violence and killing one human being by the other. They all talk in one language and that is the language of peace, harmony, compassion and kindness. The war on terror and radicalization is not against any religion, and should never be. Quite on the contrary, it is against those who believe in destroying the creation of the Almighty. 7. We laud the leadership of President Rahmon in fighting terrorism and countering radicalization. You are a frontline State against the war on terror and the world admires and respects your courage. We recognize the enormous challenges the Tajik security forces face every day. You have to fight terrorists and deal with those who are brain-washed with radical ideas. The hot-bed of death and destruction is not far from you. You also have to contend with provocations to young minds–many of which are through the Internet and social media. 8. The world that we Indians live in is not very different from yours. Terrorism does not believe in borders! India, like Tajikistan, is taking on terrorism and extremism head-on. We, too, face the problem of radicalisation but we have been successful in dealing with it. It is not the question of how we have done but rather why we have been able to do it. I wish to share some of our experiences. 9. Our inclusive society, where socio-economic partnership and participatory politics provide everybody an inherent sense of belonging to the nation has been the most effective bulwark against radicalisation. Our belief in pluralism, democracy and secularism has been successful in trumping the ideology of hate and divisiveness. From the film industry, to India’s cricket team and from the professional arena to politics, India is a land of equal opportunity and equal respect for all. A growing economy lifts one and all leading to inclusive development. 10. Our society has always believed in the power of ideas derived from our history, civilization and culture. Our age-old values of Sufism, of humanism have shielded us against dark and ugly designs. The call of our revered Sufi saint Hazrat Nizamuddin Auliya,–"Almighty holds dear those who love Him for the sake of human beings, and those who love human beings for the sake of Almighty”binds our social fabric. 11. From our childhood, we are taught of oneness, of insaniyat as our creed, of "Vasudhaiva Kutumbakam” – meaning, the world is one family. It is natural, then, that the invitation to destruction, even with its false but tempting narratives, generally does not appeal to the Indian mind. For a vast country that we are, I must share that those working overtime to infect us with their deadly virus have not succeeded and never will. 12.I must also emphasize the positive role of family and education in preventing and countering radicalization of the youth in my country. Our family-based social structure, much like yours, is a guarantee against extremist ideas. We have witnessed tremendous resilience in our family as an institution, which has prevented vulnerable youth from getting drawn into the vortex of radicalization and terror. There have been cases where parents and relatives alerted authorities to save young targets from radicalization. Added to our family and community linkages, our religious leaders have also played a pivotal role in rejecting, condemning and countering the narrative of hate and terror. 13. But we have to be ever vigilant against alienation. We have to ensure fairness and honesty in our approach. And we have to be cautious of the cyber world to prevent those who can go astray. This is challenging no doubt. But with technology, with digital finger-printing and algorithms we can out do the other. 14. The politics of terror and radicalization to destabilize society is not the monopoly of non-state actors. India has been battling cross-border terrorism for long.If you recall your early days of civil war, I am certain that similar bitter memories will resurface. You could put those days behind you, successfully repelling unwanted intervention. Our close friend Afghanistan is not so lucky. Both India and Tajikistan must work together to bring peace and stability in Afghanistan and the region. 15. India has deep and special historical ties with all Central Asian Republics. Our relations with each of them are flourishing. Our shared past and our shared aspirations have got us together in a collective embrace. We are strengthening our security cooperation programmes. We held the latest India-Central Asia dialogue in Samarkand. We are also engaging each other through regional platforms such as the Shanghai Cooperation Organization to tackle terrorism and extremism. India remains committed to collaborate bilaterally, regionally and multilaterally to strengthen the global fight against terrorism. 16. Today morning, I met President Rahmon. We shared our common concerns on the security situation around us. I complimented him for the lead taken by Tajikistan in collaboration with the United Nations to counter radicalism. We also committed ourselves to defeating these forces. In this endeavor, we can do much to learn from each other, be it for youth mobilization, effective social communication, imparting education or interfaith dialogue and conversation. We must cooperate to choke the financing networks of terrorists and their likes. And we must strengthen our security cooperation and share best practices to counter radicalization. 17. Trade and economic growth are long term fundamentals on which peaceful societies prosper. Economic progress and equity act as a bulwark against the spread of radical ideas. 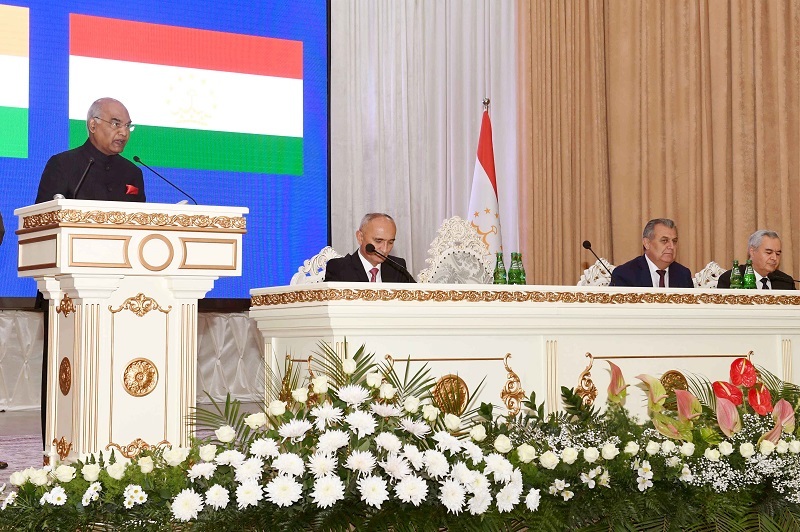 We are determined to overcome the lack of our connectivity with Tajikistan and with Central Asia, so that our economic relations grow and gallop. We, indeed, have a stake in your progress and prosperity. 18. Before arriving here, I had the honour to pay floral tributes at the bust of two great sons of India – Mahatma Gandhi and Rabindranath Tagore. Mahatma Gandhi has shown us the path of ‘Ahimsa’ or nonviolence, and the words of Tagore teach us to shun parochialism. These are eternal values that we must share and we must live. Meaning - What is human being? Perfect expression of love. He is the true meaning of universe and face of love. If we instill this love for humanity in ourselves and spread the same to others, peace and love will prevail in our hearts, in our minds and in our world.